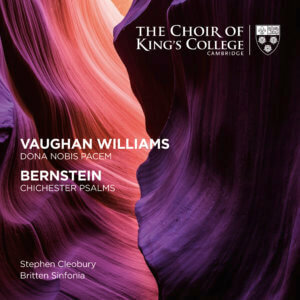 A new recording of two 20th century choral greats, Leonard Bernstein’s Chichester Psalms and Vaughan Williams’ impassioned Dona nobis pacem has been released today on the King’s College Cambridge label. Featuring Britten Sinfonia and the Choir of King’s College, Cambridge the release comes ahead of two performances of these works at London’s Barbican on Saturday 2 December 2017 and Saffron Walden’s Saffron Hall on Friday 16 February 2018 by the orchestra and choir. Both works are recorded in orchestrations for smaller forces to match the size of the Chapel Choir: the Dona nobis pacem is presented here in a brand-new arrangement for small orchestra, commissioned for this recording, resulting in an intimate performance that brings new and different colours to Vaughan Williams’ work. Chichester Psalms is performed in Bernstein’s own orchestration for organ, harp and percussion, and both performances include the recently-restored Harrison & Harrison organ in King’s College Chapel. The recording and performances also celebrate Bernstein 100, a season marking the centenary of Leonard Bernstein’s birth. For more information and to book tickets for the performances of these two works visit the What’s On section.